Overheating symptoms are as follows: • The temperature gauge needle is at the mark or the engine suddenly loses power. • Steam or spray comes out of the engine compartment. 2. Turn off all accessories and turn on the hazard warning lights. - No steam or spray present: Keep the engine running and open the hood. - Steam or spray is present: Turn off the engine and wait until it subsides. Continuing to drive with the temperature gauge needle at the mark may damage the engine. 1. Check that the cooling fan is operating and stop the engine once the temperature gauge needle comes down. - If the cooling fan is not operating, immediately stop the engine. 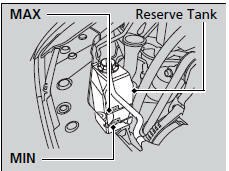 - If the coolant level in the reserve tank is low, add coolant until it reaches the MAX mark. - If there is no coolant in the reserve tank, check that the radiator is cool. Cover the radiator cap with a heavy cloth and open the cap. If necessary, add coolant up to the base of the filler neck, and put the cap back on. Once the engine has cooled sufficiently, restart it and check the temperature gauge. If the temperature gauge needle has gone down, resume driving. If it has not gone down, contact a dealer for repairs.